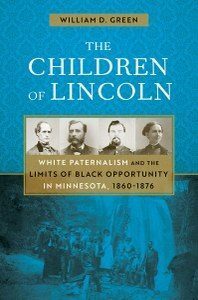 William D. Green is professor of history at Augsburg University and author of The Children of Lincoln: White Paternalism and the Limits of Black Opportunity in Minnesota, 1860-1876, which is a finalist for the Minnesota Non-Fiction category of the 2019 Minnesota Book Awards, to be awarded in April. He is also the author of Degrees of Freedom: The Origins of Civil Rights in Minnesota, 1865–1912 (winner of the Hognander Minnesota History Award) and A Peculiar Imbalance: The Rise and Fall of Racial Equality in Minnesota, 1837–1869, both published by University of Minnesota press. He is vice president of the Minnesota Historical Society.